Jared Unzipped: Racial History Months Are Divisive And Racist. I find the concept of month-long celebrations centered around a certain race to be prejudiced and highly divisive. Now, before you pull the race card and call me a bigot, let me explain. Humanity, as a whole, is 99.9% alike. Take two random people from opposite sides of the world and compare their DNA. What you'll find is that they're almost identical. If you were to study these two samples anonymously without knowledge of who donated which DNA, you'd probably have a difficult time discerning which sample belonged to which person. The only differences, that 0.01%, are merely variables that affect how and why we may develop certain diseases or peculiar health conditions. All humans are related and extremely similar. Hence, a person's ethnic heritage (race) is completely inconsequential. 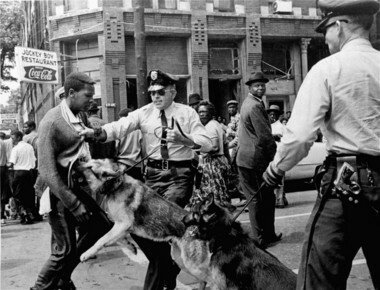 Local student Walter Gadsden is attacked by police dogs during the Birmingham civil rights protest on May 3, 1963. Did the dogs attack Gadsden because they knew he was 'black', or because they were trained to do so by the police? Race, by and large, is a social construct that mankind has generated to divide people. We label groups of humans by certain names based upon purely superficial features. This person has slanted eyes. This person has dark skin. This person has curly hair. None of these surface features reflect any sort of genuine biological division between people -- they're merely reflections of various genes (found within a very tiny portion of our entire genome) being turned on or off. In essence, race does not exist. Alternatively, you can state that there is only one race -- the human race. How does this relate to a month celebrating one particular race of people? I'll explain. February is Black History Month. Irish-American History Month is in March. Hispanic Heritage Month is from September 15 to October 15. I could go on and on with more examples, but you get the idea. Each of these months serve as a period to single out and celebrate one particular 'race' of people over another. This is akin to celebrating Red LEGO Brick Heritage Month or Green Skittles Awareness Month -- it just doesn't make any sense. If all of humanity is equal and related (which it biologically is), then what purpose is there to sequester and elevate a particular group of people that generally match the preconceived societal notions attached to a specific race label? Much less, how can you define the boundaries of a race? Are there certain qualifiers to being a member of a race? Do you have to look a certain way? Must your facial features be of a certain size? Does your skin have to be a certain color tone? Who is to say what one race is and is not? Would the judgment of one person on the definition of a race not be completely and wholly subjective in nature? Take my own genome for example, which has genetics tracing to Africa, Asia, Europe and North America. Which 'race' am I? 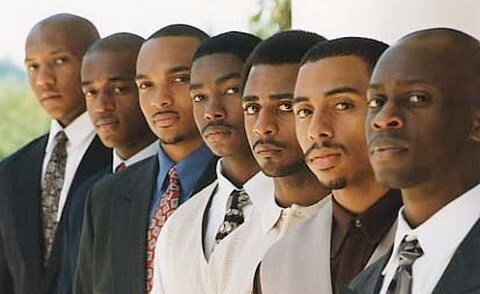 Which of these men are 'black'? Trying to define a race is as arbitrary as defining the borders between states or countries. It's all just a bunch of imaginary lines saying one side is mine and one side is yours. These lines don't actually exist. There is no separation between black or asian, white or hispanic. There are only human beings. No imaginary lines. No invented labels. That human beings are divide by stereotypical, superficial features. That the history of all people should not be uniformly celebrated in equal measure. That a particular group of people aren't as important the other eleven months out of the year. To put it bluntly, raced-based history months are, for lack of a better word, racist. It's not that I don't want only one particular race to have a month-long celebration. I don't want any month-long celebrations for anyone based upon the color of their skin. Your (yes, you the reader) ancestral history is unique and diverse, full of struggle, hardship and joy. Your forefathers and foremothers fought against hatred and bigotry, famine and disease, war and death. They crossed great oceans overflowing with peril and mountain ranges full of danger. They loved and cared for each other in times of great happiness and disastrous loss. They traveled from all corners of the globe, representing the migration of one enormous human family. Your ancestors were light skinned and dark skinned, tall and short, curly haired and even freckled. They had round eyes and almond-shaped eyes. Your family tree has branches tracing back to all sorts of people, from all walks of life. You are the living, breathing embodiment of diversity, no matter what you look like on the outside. You are not just a divisive label. You're so much more than that... and your history deserves to be revered throughout the entire year.